3. WHAT DATA DO WE PROCESS ABOUT YOU? We do not process Special Categories of your Personal Data as defined in the data privacy law, i.e. we do not process any kind of sensitive information about you. 4. HOW LONG DO WE PROCESS YOUR DATA? We use the information to maintain relations with customers, to inform customers about 4Subsea’s commercial interests, and to communicate information about 4Subsea and its products and services. Processing is necessary for the legitimate interests of 4Subsea, cf. GDPR article 6.1 (f). The legitimate interests are commercial activity and marketing (sending newsletters) and informing about current changes in 4Subsea. In our view, this does not represent a risk for your rights and freedoms. We have made individual assessments of the processing in relation to the different purposes. 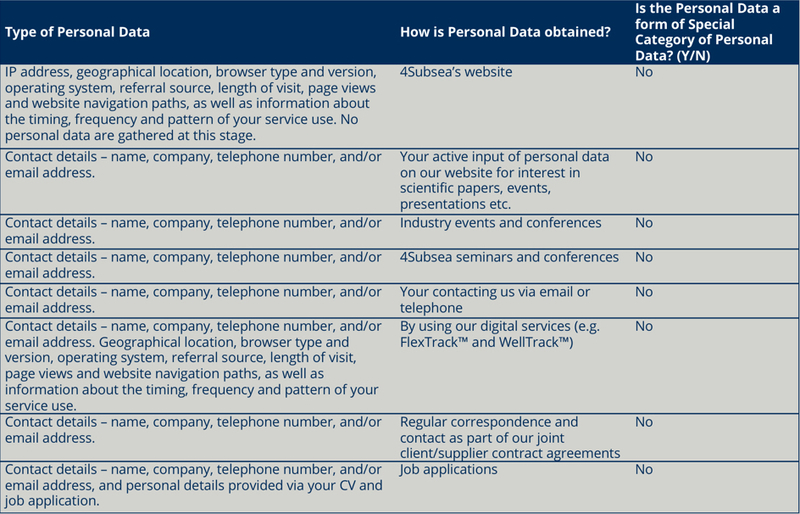 6. WHO ARE RECIPIENTS (OR CATEGORIES OF RECIPIENTS) OF THE PERSONAL DATA? In all these instances, we have appropriate contractual and security measures in place to ensure that personal data is protected. Please contact us if you need any further information, cf. section 10. 7. IS YOUR DATA USED FOR AUTOMATED DECISION-MAKING? Automated decision-making takes place when an electronic system uses personal information to make a decision without human intervention. We do not use automated decision-making. _ga: Used to distinguish users. Expires after 2 years. _gat: Used to throttle request rate. Expires after 10 minutes. _cuvid: Used to determine unique visitors to the site. Expires after 2 years from set/update. _cusid: Used to establish and continue a user session with the site. Expires after 30 minutes from set/update. _cuvon: Used to signal the last time a visitor viewed a page. Expires after 30 minutes from set/update. If you believe that your data protection rights have been breached by 4Subsea, please let us know. You also have the right to lodge a complaint with Datatilsynet, the supervisory authority for data protection issues in Norway. We appreciate the chance to deal with your concerns before you approach the supervisory authority, so please contact us in the first instance. You have the right to receive confirmation as to whether your Data is being Processed by us, as well as various other information relating to our use of your Data and copies of that information. You also have the right to request access to your Data which we are Processing. You have the right to request us to erase your Data. We shall comply with your request without delay unless an exception to compliance applies, for example if the Data is required to establish, exercise or defend legal claims. You have the right to object to us Processing your Data. The relevant circumstances where you may invoke this right are where we are Processing your Data based on our legitimate interests. If you ask us to stop Processing your Data, we will stop Processing your Data unless we can demonstrate compelling grounds as to why the Processing should continue in accordance with data protection laws or, if the information is required to establish, exercise or defend legal claims. You have the right to require us to rectify any inaccurate Data we hold about you. You also have the right to have incomplete Data we hold about you completed, by providing a supplementary statement to us. You have the right to request that we restrict the Processing of your Data. Where any exercise by you of your right to restriction determines that our Processing of particular Data is to be restricted, we will then no longer Process the relevant information, except for storage purposes and for the purpose of establishing, exercising or defending legal claims. You have the right request that you receive copies of the relevant Data provided by you in structured, standard machine-readable format and, where technically feasible, to request that this information is transmitted directly to another controller.